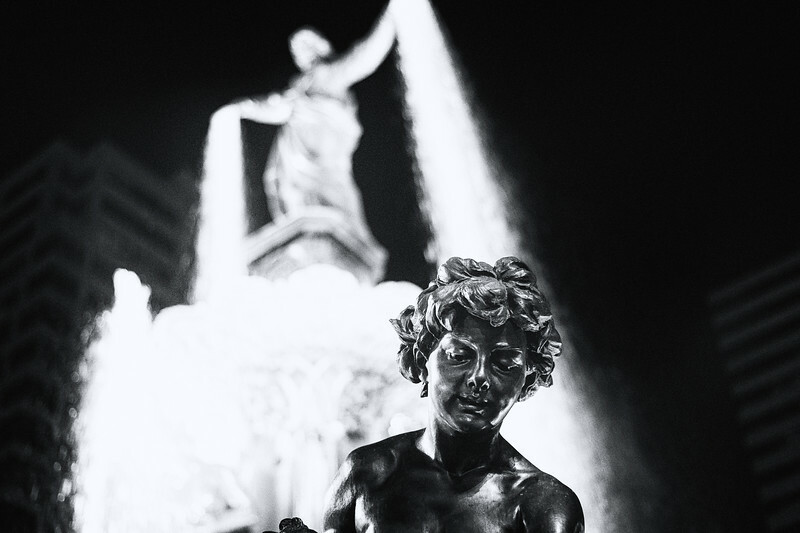 Took this one last night at Fountain Square, the public plaza in the heart of downtown Cincinnati. As civic squares go, this one is pretty uninspired -- as if a Cincy pol had his/her secretary google "generic things I can do to make it look like I care about our pre-eminent public space." But I've always loved the Tyler Davidson Fountain, which was dedicated in 1871, and that was good enough reason to visit. I took some wider shots of the fountain but it's tough going these days. If you want to shoot from the front -- that is, capture the face of the "The Lady" on top -- you're have to deal with a Rock Bottom Brewery in the background, not to mention a building that is bathed in pink light and some other corporate signage. The architects/urban planners who revised the square in recent years clearly aren't photographers. I'm not even sure they're architects or urban planners. So I tried some up close shots. I wanted to keep the image in color but parts of the fountain showed pink reflections which seemed out of place without the building also in the photo - actually they would have been out of place even with the strange pink building. I finally ended up converting to black and white and then trying some different looks in Silver Efex Pro, which I use as a Lightroom plug-in. I liked this one the best as it seemed a tad more original than the usual Fountain Square photos that I see. I'm in the midst of a two-week visit to Cincy. I haven't had much time to shoot unfortunately, but am trying to squeak in a little time -- and have some stuff I like that I'll keep posting. More of my work is on my main photo site, where you can buy prints and digital licenses.